I am falling in love with my new Automatic Nail Polish Remover machine. Maybe for the wrong reason today. 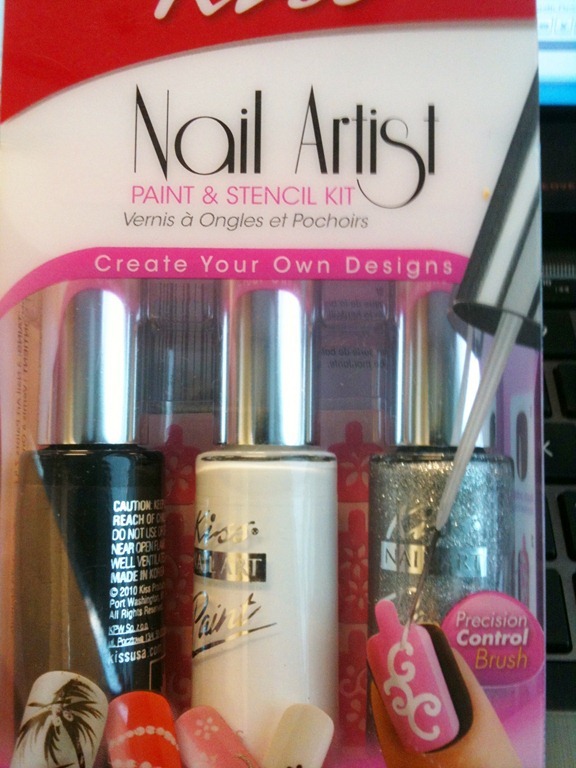 I happened upon these Kiss Nail Art Stencil sets with striper polishes while traversing the aisles of CVS on a break from work. Nope, had no business even going to that section of the store. I rushed home from work to create a work of art!! -_- NOT. 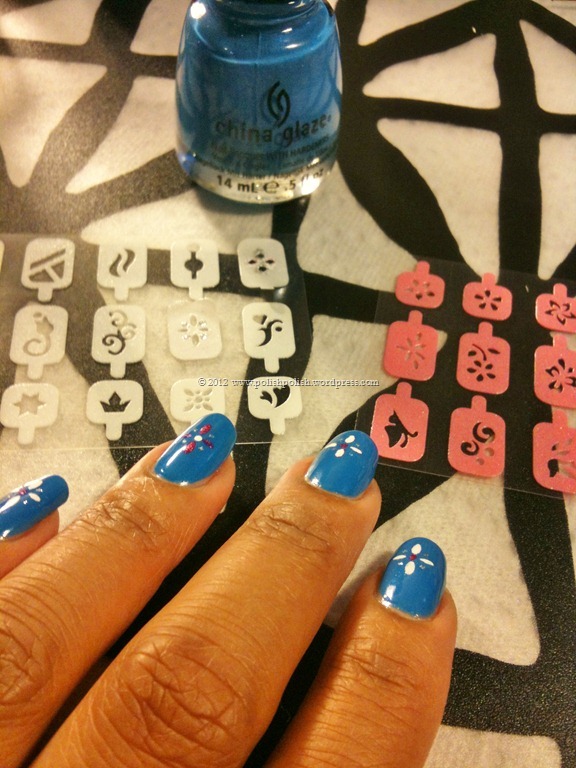 I ended up with this horrific blue monstrosity and raggedy stencil designs that weren’t worth the dot of polish I dabbed onto my nails. And I can’t even blame the polish color. I think it was brought down by the flat color choices for the design. In the bottle, the color was really rather attractive. Still fell completely flat. 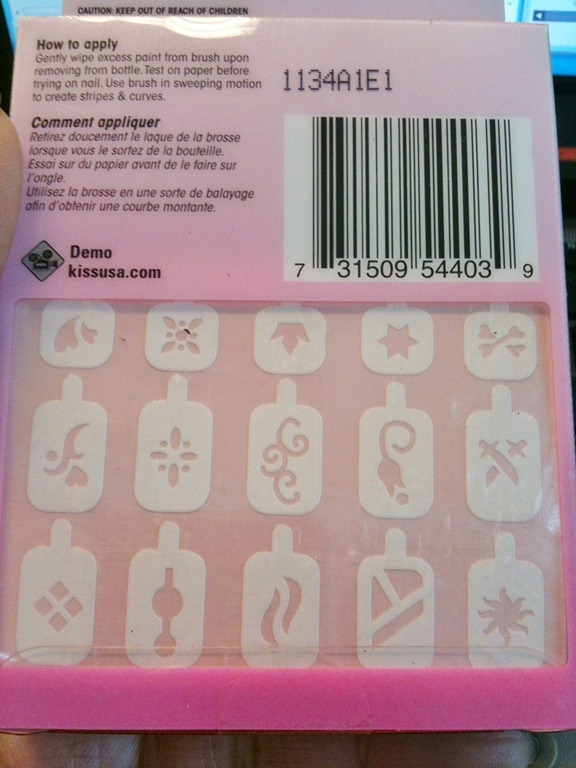 These stencils: ONE TIME USE ONLY! No I don’t mean “use for multiple nails” for one time. I mean, you can effectively use ONE stencil for ONE nail for ONE time and that’s pretty much the life cycle of the stencil. Unnecessarily difficult to work with. And though the material is decent for the first application, they don’t hold up. The design easily stretches out of shape and is therefore no more good. There is also no credible way to clean the old polish from the stencil. I tried both acetone (which really I should have known was going to nearly melt the poor stencil – I mean, that’s what is used to remove acrylic nails and glue. LOL) and polish thinner. I paid approximately $8 for this stencil set. 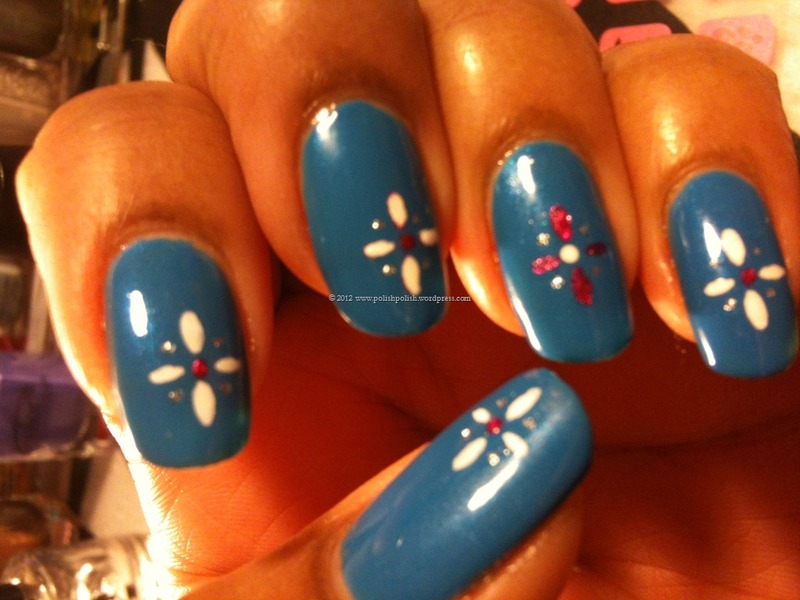 At least I got 3 nail art stripers (which would have costs me about $2 a piece) and 24 stencils out of it. THIS is where my super crush began on my new automatic nail polish remover machine. LOL. **Disclaimer: “NO COTTON SQUARES WERE HARMED IN THE REMOVAL OF THIS HEAVILY TINTED NAIL POLISH.” lol. I got these results after having already removed the past 2 manicures’ polish which included acrylic paint dots AND 5 coats of glitter polish. I did NOT change the remover solution before removing this polish. I was WAY too anxious to get this mess off my nails! Go ahead and click the picture… link to the www.transdesign.com website and get one. You know you want one. 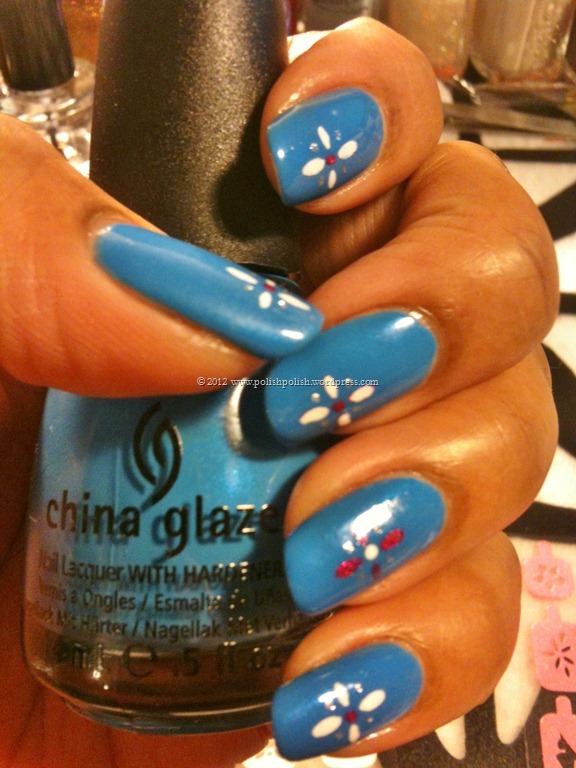 This entry was posted in China Glaze and tagged automatic, nail art, nail polish remover, Sky High-Top, stencil. Now you’ve got me longing to get one of these removers…smh. I’m so easily swayed lol. get one. $17.95. and mine actually works. i haven’t used a cotton square or cotton ball since I got it. I’m actually really surprised at how clean your nail is after using your new gadget. I imagined there would be leftover polish all around the edge of your nail. Do you think it’s faster than the traditional method? You can’t be more surprised than me! I am so happy that it works so effectively. I haven’t even reached for a cotton ball since it arrrived. I haven’t timed either process. I can say that I feel like I don’t have to pay as much attention to the process though, and it has really worked. i’m still loving this machine. lol. It was INCREDIBLE for removing the bright red polish without smears or a billion cotton squares! my only complaint is that I wish it had an electrical cord instead of having to use batteries. THEN it would be perfect. of bright fuschia, coral or red lipstick.